Since I first started Flying With Fish I have preached the mantra “pack what you need not what you want.” Using this as a packing thought process has made my life on the road simpler and lighter. Most photographers are gadget-geeks, we all have our toys that we “sort of justify” and love to use, I know I am guilty of this, but when I must pack light I have one thought process, what do I need, what can I shed, how can I save space. I have recently changed my choice in camera bodies based on my needs rather than my wants. When I was first introduced to Canon back in 1995 it was with the Canon/Kodak DCS-3 (the Canon version of the Nikon/Kodak AP NC2000c) which was based on the Canon EOS 1n film body; later in 1998 I used the Canon/Kodak DCS520 which was also based on the EOS 1n film body and when I switched to Canon in late 2002 I jumped right in with the Canon EOS 1D series bodies which was based on the EOS 1v film bodies. The Canon EOS 1 series bodies met my needs, I liked them, I loved them and after being a long time loyal Nikon shooter I was surprised at how happy I was with Canon. Why is my choice in bodies relevant to packing what you need? Simple, the 1D bodies while comfortable sucked up more space than I need! The Canon EOS 1D batteries are more than twice the size of the Canon 5D batteries (same battery in the 20D/30D/40D/Rebel/PowerShot G9, etc) and on average shoot more frames per charge than the 1D batteries! Forget the batteries, the charger for the Canon 1D series bodies takes up nearly as much space and 4 (FOUR!!!) 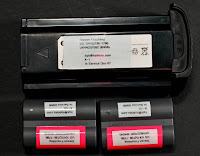 Canon 5D battery chargers when you factor in length, width, heigh and external power cord. The 1D battery charger, with two power leads, charges one battery at a time, while two 5D battery chargers can charge two batteries simultaneously. For me camera size is not the big issue. I won’t trade camera ergonomics for space, my camera is my tool, it must feel comfortable, it must be balanced, but everything else is up for grabs. I will miss the 1/250 flash synch of the Canon EOS 1Ds vs the 1/200 flash synch of the 5D……….but with the 1Ds (and every other body) I really miss the 1/500 flash synch of the Nikon D1 and Canon 1D (CCD sensors can shoot 1/500, CMOS sensors tend to top out at 1/250). So while I have always practiced what I preached about packing essentials and only essentials…….no matter how hard it may be……I have taken my equipment to a new level and chosen my equipment on the basis of saving space, saving weight and being able to charge my batteries faster (which allows me to further maximize my time on the ground). Been stalking your blog lately Fish. Great stuff man. Started keeping taps on you when we were booked for a wedding to Jamaica. Fantastic resource bro…keep up the great info. Knowledge is useless unless shared. P.S – You can sneak to 1/250th with very minimal, if not any banding at all. I have been playing with the 5D with pocket wizard and can get 1/320 with “ok” results with that set up. On camera sticks at 1/200, but I almost never use on-camera flash (well I use an e-ttl cord and hold my flash in my left hand as I shoot). This is definitely one of the reasons I bought a 5D in 2006. It’s an excellent travel camera. I love my 1DII also, but that enormous charger drives me crazy when I’m packing. This is especially true when I have to take both cameras on a trip to shoot sports and landscapes. I also just got a Mountainsmith Tour on your recommendation. It’s pretty good so far, although I’m still getting used to the idea of not having a ton of padding around my gear. I read the blog with every new post and always seem to be searching through your past. I am a photo student ready to graduate and my daily struggle is with gear, what do I need and what do I want? Reading this post made me think of radiopoppers for your camera sync speed. I don’t know if you have heard of them but the allow TTL to be sent with a radio signal which would mean you could use high speed sync. Thanks for all the great info and sharing your experiences I learn something every day I read your posts.